Brazil is developing an unprecedented social experiment that all democratic countries in the region and the world are following with the deepest concern. Instead of the traditional military coups with armed forces in the street and generals who assume power, since 2016 the powerful minorities have deployed an innovative and authoritarian multiple coup, which combine parliamentary coup, judicial coup and above all, media coup from hegemonic media such as Rede Globo. They expanded the institutional blows registered in Honduras and Paraguay. After the successful trial that drove President Dilma Rousseff away from presidency was accomplished, the objective is that Lula da Silva, first on the voting polls, cannot stand as a candidate. It is no accident that the real economic powers try to overthrow the candidacy of the former president of Brazil, because in one of the most unequal countries on the planet, Lula managed to lift more than 30 million Brazilians out of poverty. Such a transfer of resources and power to the most vulnerable was considered an unacceptable threat by those who benefit from slave labour and natural resources exploitation on a country without great governmental obstacles. Social inequality has grown along with state police bodies and private companies authorized by the government, such as “Atalaia Segurança e Vigilância” at the State of Pará, in the Amazonian region. Large landowners, loggers and mining companies hire private armies that threaten, torture and even kill people. There are also a significant number of assassins willing to kill on request, mostly protected by local authorities, and corrupt sectors of the police and justice. According to the Land Pastoral Commission, only 70 social and environmental leaders were killed in Brazil in 2017. The justice of first instance persecutes Lula and imprisons him without evidence, while they act with impunity in Brazil, intellectual authors of unlimited ferocity, private security companies with illegal practices and assassins who assassinate at great length. Lava Jato does not exist for this decentralized mafia, nor does it seem to be a priority for Judge Sergio Moro. Lula is an obstacle for the armed and rich Brazil that resolves its desires of land and power with corruption, unpunished assassinations and multiple coups of state. In Brazil, aberrant practices have been naturalized, such as chemical warfare against the poorest farmers who live on lands desired by the powerful. I myself was in the Helenira Resende camp of the MST, near Marabá, where planes deliberately sprayed dangerous pesticides on children and adults to leave the land. The same is practiced in Nova Guarita, in Matto Grosso, where spray planes threw poisons from the air over the small-farmer camp Raimundo Vieira III. 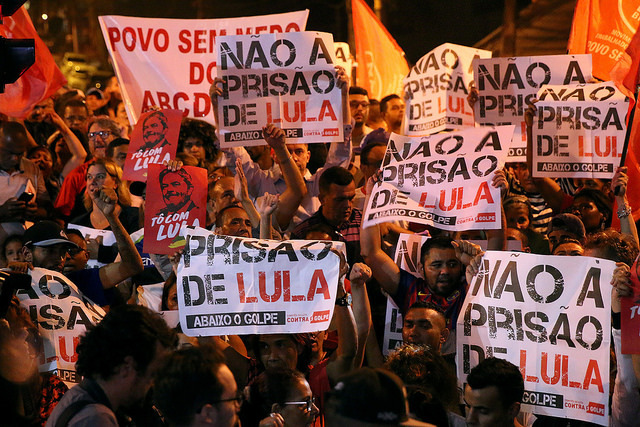 The bet of the powerful is that Lula will spent 12 years in prison. Our concern, as laureates with the Alternative Nobel, is that if Lula manages to avoid legal persecution, whether or not he is a candidate in the next elections, he may be the victim of hitmen who kill at close range. Let’s not forget that they already fired lead bullets against their caravan in Paraná, the only state that did not offer police custody during its journey. Judge Sergio Moro is in Paraná, and Lula is imprisoned in a prison in the same state. We, the recipients of the Right Livelihood Award that were in Curitiba, asked the Brazilian judiciary to comply with and enforce the Constitution; that Lula be released and his life protected. That the lives of the indigenous, peasants and rural workers of Brazil be protected. And let justice be done for those who were killed. Raúl Montenegro: Biologist, full professor at the National University of Córdoba. President of the Foundation for the Defence of the Environment (Funam) and Alternative Nobel Prize 2004.